Wrapping presents is quite possibly one of my favorite parts of the holiday. And while I'm a sucker for gorgeous paper and ribbon, the frugal side of me knows there's a reason I've been saving all those brown paper Trader Joe's bags. It's not only a great way to save a few extra dollars, but paper bags provide a perfect blank canvas for Christmas package decor. Plus, they're a great way to consciously contribute to a holiday that can sometimes be rife with wasteful habits. But why stop with recycled bags? Why not carry such green behavior to every aspect of gift-wrapping? 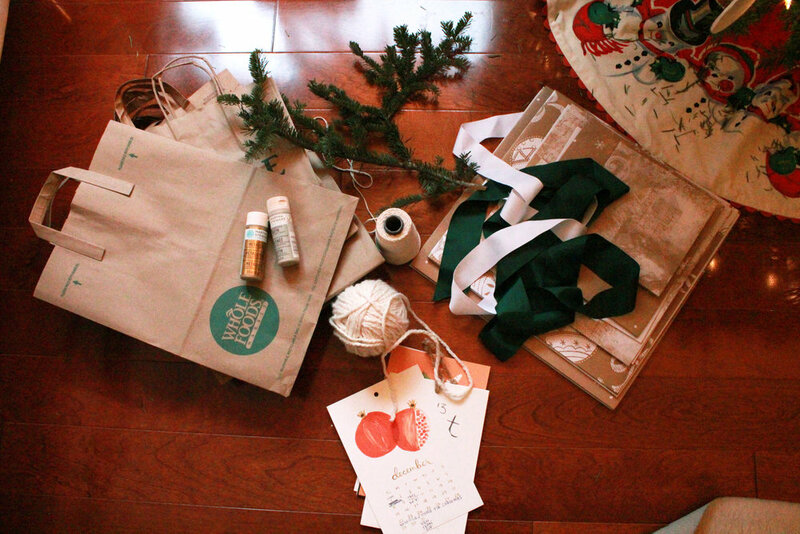 I've collected some of my favorite ethical and recycled materials to use for decorating gifts this Christmas. You gotta have a solid foundation, but paper bags aren't the only way to start recycled wrapping. You can also use tissue paper you've saved or collected, fabric from thrift stores or recycled wrapping paper. Believe it or not, there are some great companies that make beautiful paper created from post-consumer materials. Such as Green Field Paper Company and Inhabitat. If you're not feeling the all-brown vibe, you can spice up your bags with a little color. You can use water-based paints to make your own designs, or find fun stamps that can be reused year after year. Nature is an ideal source for wrapping decor. You can snip leftovers from the tree, or head outside to scavenge for pinecones. Regardless of your preference, adding a touch of outdoors to your gifts is not onlybeautiful, but very green. Pun intended. Perhaps it's strange, but I'm notorious for saving ribbons throughout the year. Whether I keep them from presents given to me, or from department store purchases, I somehow always end up with at least one bag full. Another awesome ribbon alternative — and one of my favorites — is yarn. This year, I used yarn I unraveled from an unwanted sweater. Another idea is bakers' twine. It's useful for under the tree and in the kitchen. I've tried just about every idea when it comes to name tags, and there's really no right or wrong. But some of the best tags come from stuff you just have lying around the house, or even lingering in the waste bin. This year I used old calendars. I loved the paintings from each month, so instead of just tossing the pages, I turned them into tags. You can also do this with old stationary or note cards. Ultimately, when it comes to wrapping gifts the recycled way, just have fun and get creative. This is the perfect time to utilize all that "craft" stuff you have sitting in the closet. Plus, friends and family will love the personalized touches and the fact that you took the time to go the extra mile.